I had Visual Studio 2015 RC installed and installed Visual Studio 2015 RTM over it. I couldn't find anything on the internet that said you couldn't do this. I don't know if this is relevant to the problem. "The 'Microsoft.VisualStudio.Editor.Implementation.EditorPackage' package did not load correctly"
It said to look in the ActivityLog.xml. I couldn't find Microsoft.VisualStudio.Editor.Implementation.EditorPackage. <errorinfo>'providers' cannot contain a null (Nothing in Visual Basic) element. At Tools --> Extensions and Updates I have tried to de-install and re-install the extensions. But when I click on the menu item "Extensions and Updates" I get the "Object reference not set" exception?? So I can't try this option. I have deinstalled Visual Studio 2015 and reinstalled it. No effect. I have done what is suggested in https://connect.microsoft.com/VisualStudio/feedback/details/1123745/setsite-failed-for-package-microsoft-visualstudio-editor-implementation-editorpackage at 13-2-2015 at 16:49. No effect. In fact the entire exact same folder structure and files (at a quick glance) gets copied back after starting up Visual Studio 2015 again. So... Any suggestions out there? I just tried to load a project and... Something is very wrong. It can't load a bunch of packages like: "CSharpPackage, IntegrationPackage, MigrationPackage, FileIndicatorPackage, etc..." and the Solution Explorer is completely blank! What is going on? I have uninstalled and removed as much as I dared. I don't want to mess up my Visual Studio 2013 installation. VS2015 still can't load the packages above! So if anyone has more information as to which programs exactly can be uninstalled from the above screenshot I would be very happy. Removed anything that has to do with Visual Studio 14.0 from Program Files basically. Anything left over from uninstalling in Programs And Features. Hope I didn't forget anything, but bottomline is to totally get rid of anything visual studio 2015 related. Reinstall visual studio 2015 RTM and it should work now. I have to install some 3rd party stuff again, but atleast it works! I have visual studio 2012, 2013 and 2015 all installed on my machine. After installing Visual Studio 2013 Update 5, I started getting the "package did not load correctly" error in VS 2013. Instead of deleting everything in the folder (as suggested by step 2 above), it is much more safer to rename the folder and allow Visual Studio create a new one. Sometimes, you might have to copy somethings over from the old folder. I hope this further help you all. Change binding redirection for System.Collections.Immutable, newVersion should be 1.1.37.0 (not 1.1.36.0). Once renamed, I opened VS2015 and received more of these errors but the 14.0 folder was recreated. 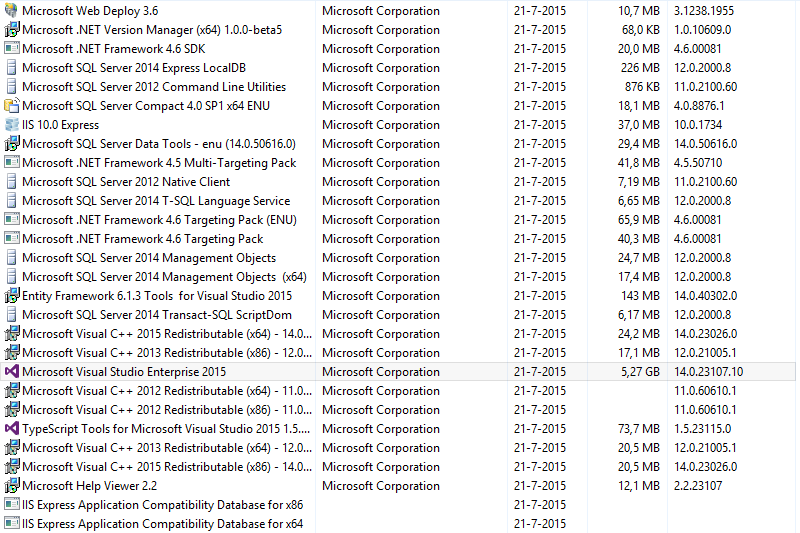 I closed VS2015 and copied the folders Extensions and STemplate from the original/renamed folder to the new one. Reopened VS2015 and all is working again. I didn't have to touch anything in the Roaming folder, but that might vary from user to user. cd "%ProgramFiles(x86)%\Microsoft Visual Studio 14.0\Common7\IDE"
Had also a in Visual Studio 2015 RC. Followed the answer from Shittu Olugbenga, Aug 10 by deleting the content of folder: "C:\Users\\AppData\Local\Microsoft\VisualStudio\14.0\ComponentModelCache". Restarted Visual Studio and it worked. :) Tnx. I try to change the registry key, but it did not work. I really never worked, uninstall the previous version, but try it and it worked! I run all of the above tips as well. I do not know if that's necessary or not. A cordial greeting. Not the answer you're looking for? Browse other questions tagged visual-studio visual-studio-2015 or ask your own question.